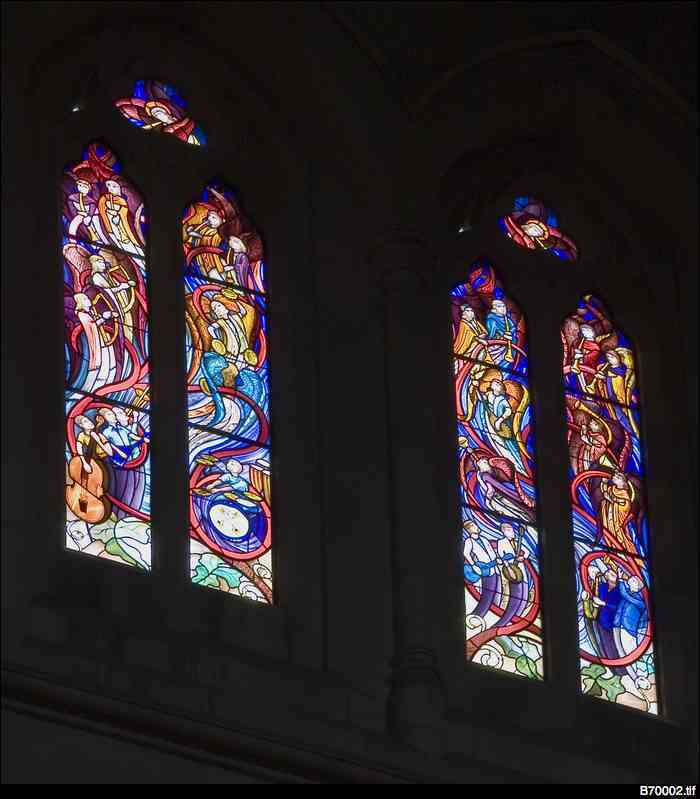 In 1991 Adelaide artist Cedar Prest was commissioned to create new clerestory windows for St. Peter's Anglican Cathedral. This included windows in the sanctuary, on each side of the choir. For the choir windows the artist chose colours to reflect those in the Morris design windows of the nearby Lady Chapel. Prest's designs were inspired by the words of Psalm 150 prescribing the making of music to praise God, in keeping with their location alongside the choir. Angels float above the heads of robed choirboys in the southern windows, and are continued above a band playing modern instruments in the northern windows. The bass drum of the musicians bears the emblem of St. Peter, patron saint of the cathedral. The windows also contain a winding red ribbon representing the movement of the Holy Spirit, a continuing symbol from the clerestory windows. The figures were drawn and painted by Lance Feeney.